This blog is about a change in the West. Varied swamis have paved the way. Considered here are Dante, Rabbi Loeb, Madame Blavatsky, Einstein, William Butler Yeats, Wolfgang Pauli, Neils Bohr, Andre Breton, Rene Magritte, Salvador Dali, C.G. Jung, The Beatles, the Apollo astronauts, Lao Tsu, Tolstoy, Black Elk (at right, below), Neo, the 14th Dalai Lama, Kurt Cobain, George Lucas and Stephen Spielberg. The most recent to appear is J.J. Abrams, creator of Lost (see below), but others haven’t arrived yet. 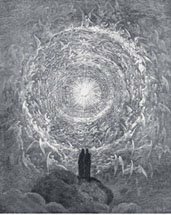 Dreams, the deepest and truest stories, are generally silent stories told in pictures and this blog has much to do with dreams. In blogworld, this story can be told in pictures as well. As is the nature of blogs, it begins at the other end, here, and ends below. But blog is its own literary form and genre and has its own life force so click here (Cities are Particles and Waves and So Are People) or here (Zen Quilting) or here (Salvador Dali's Dream of the Second Coming of Christ as a Buddhist monk emerging from the Christ wound of Pegasus, the Aquarian awakener - at left, above) or start anywhere you like, as is the custom in blogworld. "The crosses are all full," said the lay brother. "Zen demands intelligence and will-power, as do all the greater things which desire to become real." These are the words of C. G. Jung in the introduction to D.T. Suzuki’s An Introduction to Zen Buddhism. Jung’s words and observations would win him a place top row center, right next to Edgar Allen Poe, on the cover of Sgt. Peppers. 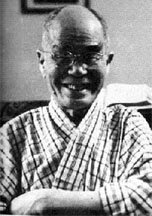 In the 1950s Suzuki was always referred to as Dr. Suzuki – much as Richard Gere is referred to as only Richard today by Tibetan Buddhists. It is kind of an honorarium, a title. Dr. Suzuki was a solid forefather on the path East and one of the very first learned Masters to come from the East to the West. In the 1950s he taught at Columbia University and was a celebrity in New York City, an exotic but common monk with a great smile and a pure vision of Zen. Personal experience is everything in Zen, said Dr. Suzuki. No ideas are intelligible to those who have no backing in experience. Mystification is far from being the object of Zen itself, but to those who have not touched the central fact of life Zen inevitable appears as mystifying. Penetrate through the conceptual superstructure and what is imagined to be a mystification will at once disappear, and at the same time there will be an enlightenment known as satori. Dr. Suzuki talked straight: personal experience is everything in Zen. The purpose of life is love. I’m not sure if John Lennon read these words but perhaps his wife, Yoko Ono, did. She was a key figure in the avant garde art scene in New York City at the time and had been in New York for a long time, even as a student at Sarah Lawrence. She was well known as a conceptual artist before she met John Lennon, and lived and worked in the same realm as people like John Cage and Marcel Duchamp. These would be the first people in New York to listen to Dr. Suzuki. The art students were always the first to catch on, and John Lennon and his friend Stu Sutcliffe were the art students who started The Beatles. They were like pilot fish for the rest of us who were born at the end of the war and it was quite a large school of fish. 40 million people. All our fathers had been warriors. We were all the same age and born within months of one another, conceived by men who had been a long time without women, directly on return from war in Asia and Europe. For us it was a bristling, exciting respite between childhood and adulthood and we were interested in new things. There were no teachers around to deflect our learning, no priests to lead us astray. For the briefest period, all of the shields were down. Other voices would come shortly. Swami Yogananda, who wrote The Autobiography of a Yogi, would become very popular for awhile. John said he read about half of it, which I thought was pretty good, as I’d only managed about 80 pages. Later, the Maharishi Mahesh Yogi and Tolstoy. But Suzuki’s message entered the river of our generation at the same time as John entered our river. At first much of the Zen around New York was dark, misunderstood in the West as nihilism, the shadow which withered the Western heart after 500 years of exploration and dominance. But John and Stu understood Dr. Suzuki’s Zen message that love is the purpose of life. 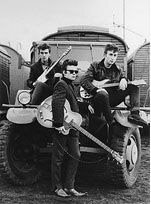 John is said to have started The Beatles to have something to do with Stu. When McCartney entered the group he drove them to become more serious and businesslike. But at first it was always John and Stu. Stu had the artist’s eye for style – naming the group The Beatles after seeing Lee Marvin and Marlon Brando in The Wild Ones. Lee Marvin’s motorcycle gang was called The Beetles. Stu always attracted the coolest people as well. And when they went to Berlin before the group was fully formed he attracted the beautiful photographer Astrid Kirchherr, who would become an anima figure – a muse – to the group and open them up in the mind in new ways and awaken new music and images. An avante garde photographer in Germany, she and her friends, including Klaus Voorman, traveled in the seedy night scene in Berlin and met the group there, which was still going under the name of The Silver Beatles. She gave them the playful Beatles haircuts. Friendship would bind them. Stu married Astrid and Klaus later drew the cover picture for the Revolver album, and much later, after The Beatles had broken up, he played as a background musician on the Imagine album. Personal experience would guide the fledgling poet as well, and like many ordinary men before him, Lennon became great when someone he loved died. He would remember them all. And he would remember Stu, who never returned to England with them. I know I’ll always feel affection, for people and things that went before. I know I’ll always think about them. But it was different with Stu. This requiem, this love song, is considered today to be one of the greatest songs ever written. It is the beginning of the artist’s journey for John Lennon. The Sixties was a cacophony of a million sounds and smells and voices and music and colors and textures, but especially music. The electric guitar was like a key; an ancient iron ornamented key to a mediaeval dream door that would open to an age. Every age, be it short or long, has a beginning, a middle and an end, like a person’s life, and this age was no exception. This age, someone pointed out, came with its own sound track. And it rose and fell rather quickly. At the center was The Beatles and the Sixties rose and fell with the fate of the Beatles. And at dead center, the man in the center of the Beatles was John Lennon. From beginning to end The Beatles was about John Lennon. 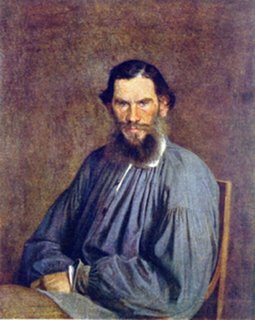 He was not the most important innovator or instigator of the period, except perhaps in music, but the music would eventually become secondary to his life, as literature had become secondary to Tolstoy. He was one of us, common and working class, but of course, more gifted. And the transformation he made, we made. Eventually he left The Beatles behind to complete the passage himself. He was the Man at the Center who made passage with us and for us and completed the journey on our behalf. And I don’t think we could have or would have completed passage without him. The remaining Beatles say they were transformed by Bob Dylan like the rest of us were. John was as well. It shows in his pictures. It shows in his clothes and in music like Norwegian Wood, a folksy, spare song inspired by the folk scene, written when the Beatles would begin to rise to a higher artistic level. John, they say, wanted to conquer the world, which The Beatles did with ease. Then, when they heard Bob Dylan, they aspired to be artists. Dylan opened the gate and performed the Rite of Entry to the age with his soulful cohort Joan Baez, and the age rose to the center when The Beatles reached their artistic apex. Then followed the rite of exit with Joni Mitchell and the howling animal cries of Neil Young, mourning the passing of the brief and sacred moment. The Beatles, at the top of their creative arc -- that would be somewhere within the Sgt. Peppers area -- brought the defining moment to a generation. Some 30 years later, in January, 2001, New York Times columnist Maureen Dowd contrasted the generation with George Bush, Jr., who last week threatened to cast the first veto of this presidency to overthrow Congress’s attempt to ban his policy of allowing the torture of military prisoners. 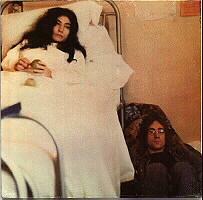 Not unlike George Bush, John Lennon was preoccupied with Jesus. You could see it early on with the trouble he got into when the Beatles were first big. Fans would crowd them and overwhelm them and once John said to a crowd of reporters, “We’re more popular than Jesus.” There was no arrogance to it, but subtle awareness. The Beatles were more popular than Jesus. Yet Bush and Lennon couldn’t be more far apart in their quests. Likewise with the Beatles. When they began their real creative work, they left behind the casings of their early ego identity, pictured as four mop-top wax dummies in early Beatles suits at what appears to be a burial on the cover of the Sgt. Peppers album, while the “new” Beatles appeared above like butterflies just left the cocoon in brightly colored satins and playful epaulets. This is the classic pattern of the journey of the shaman described by anthropologists and it occurred with John as the Beatles rose to the top of their creative arc. IN this kind of psychological transformation, the man or woman who is about to enter into Unconscious falls, out of nowhere and against his or her will, into a funk. He falls into a torpor, a sickness of the mind and heart and feels a worthlessness to his life. He goes through a period of spiritual death and descends deep into the earth. Afterwards, he ascends and rises into heaven. Finally he emerges transfigured and enlightened god king, leaves the celestial place and comes out, usually down from a mountain, with a simple transforming idea for the tribe, a gift from the Land of the Dead. Lennon went through such a transformation, falling into a psychological funk and getting fat and afraid at the peak of the Beatles initial popularity (“Help,” he sang. “I’m a loser, and I’m not what I appear to be.”) Then at the Revolver album, something new began to happen. Suddenly there is a sense of entering the river, an image which occurs in dreams at times of birth or death (“turn off your mind, relax and float downstream,”) and at times of psychological transformation. In Buddhism and Taoism, it is the sign of a new awakening. He sang a second song on the same album about floating downstream in a transcendent, blissful sleep, while everyone thinks he is just lazy, (but “I don’t mind,” he sings, “I think they’re crazy”). Some say I’m Only Sleeping is aesthetically the best song he ever composed. In terms of anthropology, this is the first orientation of an earth shaman finding his feet in the Underworld – the creative unconscious – the world under the earth, where he will take you down with him into the density of the earth, but this is the Subtle Realm of the earth, the Underworld, where “nothing is real” in Strawberry Fields. And there he finds clarity and confidence, but in a new world, the world of the Unconscious where there is understanding of all you see with eyes closed, and the old world becomes a shell, a mere caricature of psychic life. The shaman then ascends out of the earth and into the sky, like Jesus rising out of the tomb and entering heaven. John and the Beatles rise then to the very height of their work in Sgt. Peppers Lonely Hearts Club Band. And here at their best work is the shaman’s archetypal journey to the heavens in Lucy in the Sky with Diamonds. Like the Underworld of Strawberry Fields, the Astral Heavens also have otherworldly features, like newspaper taxies and magical rivers with tangerine trees and marmalade skies (like the tree “showered with reddish blossoms” blazed in light, a cosmic vision Jung had – a “vision of unearthly beauty” which oddly enough, took place in Liverpool, home of the Fab Four. Lennon’s dream vision in Lucy in the Sky with Diamonds also echo’s Dante’s, looking upon the stars from above, in Paradise: “I saw light in the shape of a river/Flashing golden between two banks/Tinted in colors of marvelous spring./Out of the stream came living sparks/Which settled on the flowers on every side/Like rubies ringed with gold . . .”). Lennon’s favorite book was Alice in Wonderland and the Abbey Road album contained a snippet of Lewis Carroll's prose. 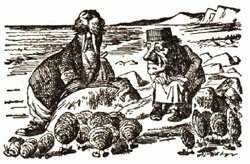 He may have drawn on Lewis Carroll’s wise Walrus, who would fit right in on Sgt. Peppers, holding forth on cabbages and kings to a horde of oysters. This expression reflects the sentiment of the Upanishads in which the Atman (the Eggman) or the individual soul, finds itself at one with another individual soul, then another, then the whole soul, the world soul, the God consciousness, the Brahmin (the Walrus). It is what Jesus had become after he had gone through the Transfiguration, referring to himself as at one with the God force, at One with the Father. This is the Brahma consciousness. The Beatles were at their peak with Sergeant Peppers. There John would find fulfillment, anthropologically speaking. 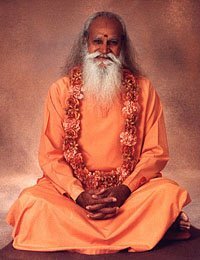 Then he would journey to the East, although Paul and Ringo were bored, and find the mystic Maharishi Mahesh Yogi, a father figure to him, but a Great Father, a spiritual father, not an earthly father. The shaman’s work is essentially over by then, except to bring the gift idea to the community. The shaman has brought the tribe with him through the transformation of the Unconscious. It is up to us after that. Yet some of the Beatles greatest work would come as they traveled down the back side of the mountain. The White Album is still a favorite to fans. One song, I’m So Tired, wonderfully reflects the rite of exit of the exhausted artist that comes at the end of the transformational passage, balancing the liberating I’m Only Sleeping, at the rite of entry. “Can one live with a shattered glass?” the guru classically asks a Tibetan monk who has just found Enlightenment. The Walrus, of course, was John. Coming off the backside of the mountain – and on return form India - John sometimes believed he was carrying – channeling, we say – Jesus and said so to the Beatles. And he made occasional references, even paraphrasing the Gospel of Thomas “. . . the inside is out/the outside is in. . .” on the White Album. The full text is, “Jesus said to them:/When you make the two one,/and make the inside like the outside,/and the outside like the inside,/and the upper side like the under side,/and (in such a way) that you make the man/(with) the woman a single one,/in order that the man is not man and the/woman is not woman; when you make eyes in place of an eye,/and a hand in place of a hand,/and a foot in place of a foot,/an image in place of an image;/then you will go into [the kingdom].” – from The Gospel of Thomas. This preoccupation with Jesus appears again and again. “Christ, you know it ain’t easy,” he sang in one of his last songs, suggesting in The Ballad of John and Yoko that he, like Jesus, would be crucified. Even later, at the very end of his life Jesus is suggested. All through the most creative period, the shaman’s journey from Sgt. Peppers to the end of Abbey Road, John wore a special flowered talisman around his neck. Afterwards, he stopped wearing it. But in New York, in one of the later pictures ever taken of him, a well-known photograph where he is wearing a t-shirt that says New York City across the front, there is a tiny cross hanging from his neck. At the end of the Beatles period John continued in a prophet’s journey. Like Moses and the Bodhisattva, he returns from a celestial vision on top of the mountain with a simple transforming idea, as Moses did with the tablets. It is the same idea that Leo Tolstoy, a Great Father figure to the non-violence movement of the Sixties, had brought to the world after his night of the dark soul when he went through a religious transformation. Lennon, with his wife Yoko Ono, entered the peace movement when he left the Beatles, and like Tolstoy later in life, attempted to apply his natural gifts didactically to public purpose. He is said to have been reading Tolstoy’s late non-fiction work on religion and non-violence as many were in the late 1960s, and his final word, the simple transforming idea he brought down from the mountain is precisely the same thought as Tolstoy’s: Imagine there’s no country, it isn’t hard to do. . . Imagine all the people living life in peace. It was time for the removal of all barriers. No country, and no religion, too. 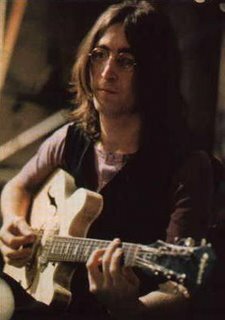 This would be Lennon’s final impression on the people: Imagine there’s no heaven, it’s easy if you can, no hell below us, a brotherhood of man. This is precisely Tolstoy’s religious conviction at the end of his life. He advocated abandoning identity with a particular prophet as one would abandon nationalism. John’s swan song, Imagine, reflects timeless Buddhist sentiment like that presented in What the Buddha Taught by Walpola Rahula, which had gained popularity in the Sixties. And is likely an intentional reconstruction of Tolstoyan philosophy which was deeply influenced by Buddhism and Taoism. Intended or not, it completes the shaman’s journey and begins the transformation of the group. 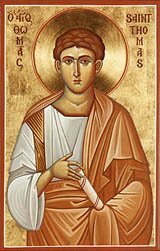 Imagine also bears a relationship to The Gospel of Thomas. Elaine Pagel's book Beyond Belief: The Secret Gospel of Thomas, states that in Thomas’s account, Jesus challenges those who mistake the kingdom of God for an otherworldly place or a future event: Jesus said, “If those who lead you say to you, Look, the kingdom is in the sky,’ then the birds of the sky will get there before you . . .” In a word, Imagine there’s no heaven. William Butler Yeats writes: “What portion in the world can the artist have/Who has awakened from the common dream/But dissipation and despair?” Such was the lot of John Lennon. One of his biographers writes that he was never happy again after the Sgt. Peppers period. The pictures show it. He never smiled again for the camera after he returned from India. 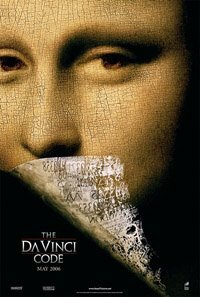 We enjoyed the The DaVinci Code movie yesterday. What is fascinating is the "return to earth" aspect. We return from space and land in the 12th century. This movie is very like "first encournters" with space aliens movies in '50s - they are terrifying and frightening - like the mad monk of Opus Dei. But as space contained riddles to enlightenment, so now does the Earth and its Church, the Roman Church of the 12th Century. Since 9/11 people have greater dreams of the Pope - in one such dream the Pope gave a woman gold coins, while a contemporary "suitor" gave her chocolate coins covered with gold paper - false coins. Contemporary dreams parrallel this; as Dreamers dreamed of UFOs n the '50s and '60s, today they dream of "travelling" in the 12th century & into the earth. The Earth is giving birth again to the Human condition. Jedi Knights are astral versions of Knights Templar & today almost half the books on the NYTs best seller lists are about Templars. Parrallel event is the ascention of Pope Benedict. I find him a man of character & of the old ways. As early UFO dreams portended visions or an ascending space age, this movie portends a renewal of the Old Ways of the Catholic and Orthodox churches of Europe. The dual triangles represent a yin and yang vision as the movie presents it, but in reference to the I.M. Pei triangles in the courtyand of the Louvre, the question should be not that they exist, but why is one big and one little? What is their nature? Why is one underground and one above ground? What are their qualities? If they are not identical as in the tai chi symbol, the one dominates or "territorializs" they other, and gives a clue as to the nature of the age we are in and the age ahead. In the previous age, from the time of Christ to the 14oos, the yin and yang was represented by the image of Madonna and Child motif. It was a yin age and the Mother figure ascended and dominated the yang figure, the Baby Jesus. The ultimate yin symbol of this is down the road a few blocks from the Louvre, on the Ile de la Cite, Notre Dame (Our Mother). In the old portraits and paintings, the Mother represented the Earth, the Christ Child the Human Race. These features tell the story; they were seperated, one from the other, in the time of Leonardo - he opposed the seperation as the movie implies and it is clear in his pictures by suggestion. See Mother and Child & Triple Goddess here. This is an awakening moment for our century. In Alchemist terms (Templar) the Horse has arrived in the Courtyard. There is a rational explaination for everything in the world. Zen calls this the world of samsara. Then there is a degree of irrationality of everything. The pattern and substance beneath this world is called nirvana. Templar travels the path to nivrana. 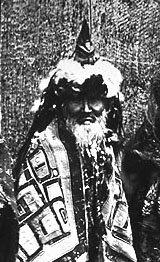 He is the zen man, the Jedi monk/warriar described in The Tao te Ching as the Knight of Dark and Mysterious consequence ("The ancient masters were subtle, were possessed of ineffable efficacy, and were in dark and mysterious confluence, so profound that they could not be perceived.' - #15, Tao te Ching) and illucidated in the air as Jedi Knight. His sign is two on a horse. This journal was begun with a dream about Knights Templar & a dream of two on a horse. LOST, a Taoist Classic: "The Brothers Karamazov" meets "Night of the Living Dead" - Henry Gale, marked by the Christ wound . . . Note to Readers: Viewers of Lost will appreciate Miss3's dreams as well. Like Shiva, Henry Gale casts aside his old body for a new Dance of Creativity - a dance of rebirth; the eternal dance of life and death. Hidden in its center of Lost is a contemporary Quaternity. With pseudo-ads for Hanso's Corp.'s (see Hans in Thomas Mann's 1924 classic, The Magic Mountain, for Lost prototype) "subliminal advertising" and spin offs like the Bad Twin book, Lost brings the Trickster forth like we haven't seen him since Sgt. Peppers or the Surrealist Movement of the 1920s. Lost fans might be interested in my "Three Sisters" essay in this blog about Buffy, the Vampire Slayer. In the last Buffy episode, The Slayer is revealed to be the Earth Mother incarnate, scion of the Triple Goddess & the Lady of the Lake, the ancient-most archetype of the English-speaking people. She who put King Arthur's Sword into the Stone. (Buffy pulls it out.) I wrote the essay several years ago. (I just ran into Lost last month, when it came to my country store on DVD.) Buffy is prelude to an Awakening of the Earth Mother, the essay claims, to come in the first days of the new millenium. "But today, as it is heard in a song/a prayer by Amy Lee, Evanescence and 12 Stones, she falls in sleep and has been sleeping a thousand years. She cries to have her eyes opened again and to see again and to Awakened Inside Again and to Saved Again from the Nothing that she has become." Among the Haisla people of British Columbia the Kermode Bear; called Spirit Bear because it is a black bear that is colored white, is considered a sacred animal. The tribal elders say that when you meet with Spirit Bear the Creator has a message for you and your tribe, or some healing is needed. It is a sacred moment and a moment of transition. The TV show Lost begins with an encounter with Spirit Bear. 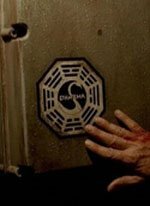 Lost has the same psychic tone as early UFO dreams and movies of the 1950s. Naïve (popular, entertaining - the common stone of the culture) and unpretentious art and stories always reflects these changes. The Survivor TV series and all of its knock offs are a reflection of this “return to Earth” theme in the naive culture (as Close Encounters, E.T., Alien and The X Files were "entering the Universe" dramas in the Space Age). Lost is the mythic drama which portends a new period of cultural awakening to the Earth, just as Close Encounters did to space. The Earth shares consciousness with the humans and the humans are part of the earth. This is the natural state of humans in their natural environment. Princess Mononoke, the film by Hayao Miyazaki, the computer game Myst and Touching Spirit Bear by Ben Mikaelsen - three of my children's favorites and mine - make a contribution. And common themes from Jane Eyre, Women in the Dunes, Gilligan's Island, The Wizard of Oz (Henry Gale), Frances Hodgson Burnett's The Secret Garden, Gurney's Dinotopia ("Each person who arrives in Dinotopia becomes reborn, and the birth is different for each individual," says Levka) and multiple others are applied and suggested. 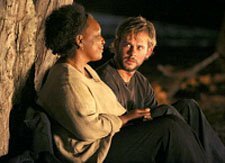 Notice that there are only two old people in the story; an old African-American woman named Rose (who sits closs-legged and quiet on the beach) and an old shamanistic guide name John Locke. Rose the symbol of Inner Life and the Unconscious (Yeats, Jung and the Alchemists - the Rose and the "Rosy Cross" was their symbol - Rosacrucians, Templars; y'all seen The DaVinci Code? ), John Locke the father of the Enlightenment and the Age of Reason. They are the yin and yang (Love and Power; in the narrative voice on Lost, "faith and reason") represented occationally throughout the story by two stones, one black and one white. Lost is a generational story - all the characters are young, and it is a story marketed to teens. Notice as well that except for the child, Walt, all of the characters wear long pants all the time (on a tropical island - compared say, to Survivor). It is a sign of responsibility and serious intention. It is geared to the fourth post-war genertion; the first generation which will take full responsibility in the new millenium (see William Strauss and Neil Howe, The Fourth Turning). Most of the names and relationships in Lost appropriately suggest the spiritual and psychological condition at the end of the Second Millenium after the brith of Christ and the awakening of the Third Millenium, which awaits the second face of the avatar. The baby born on the island is Aaron, for example, who started the Judeo-Christian procession millenia back, incarnate again in the awakening age of Aquarius (which began, technically, on January 1, 2001). Some of these relationships are quite uncanny. The birth of Aaron restores and reunites the Earth and the Earth Mother (Claire) to its human occupant and natural child, after 500 years of separation. The island itself has a yin spirit (a Dakini in Tibetan culture), a French woman named Danielle Rousseau (like John Locke, Jean Jacques Rousseau was father to the Enlightenment), who has been driven to madness because she "lost her baby." This is the core theme of the rise to the Renaissance as it found flower in philosophers Locke and Rousseau, discussed earlier in Madonna/Child portraiture in which the Christ Child, representing the human race, is snatched from the arms of the Divine Mother (or Earth Mother or Mona Lisa - who represents the Earth), causing 500 years of alienation, division and divorce between earth and human. Jung and Pauli’s book on the subject of synchronicity is The Interpretation of Nature and the Psyche, published in 1955. The tragic mine accidents taking place today in West Virginia and Saskatoon all in a sequence are synchronistic events reflecting the prevalent “returning to earth” myth – the prominent and directing myth in the culture today. Of course, no government officials will view this prognosis seriously, and increased shifts in the mines is an obvious contributor, but just the same, they should shut down the mines until they have reviewed all safety procedures as West Virginia is doing and look at safety for the miners with new eyes to insure their safety throughout the industry in The United States and Canada. Congress should also reconsider its proposed spending for Space exploration and use as a barometer for public interest in these efforts evidence in the pop culture. The only space story generating interest today is that of an empty space suit, silently orbiting the earth, which was thrown out of the international space station. Space exploration is a scientific venture. If adventurism and novelty are removed from these projects they will be safer and more successful. 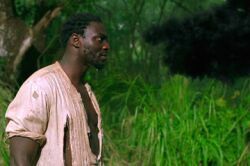 Ahead, Mr. Eko has been shown to be the man of unequivocal faith, while John Locke’s faith is all in the head. Locke fails, but Eko will bring the Dharma Inistative forward – Locke to be his second, following in Eko’s faith. Ben as a Christ figure is way interesting because although he is identified by the Christ wound and the Bros. K book, we see him and we know him to be a bad character – manipulative and self centered – he leaves his girl to die in the prison and Jack saves her. Easy to see that the entire Others cult is tired of Ben and the whole Dharma deal. But Mr. Eko does not see the bad parts & could take him – Ben – as the second Christ; the second face of Christ in the new Platonic month. FYI Lost is about a shift in Platonic Months, a 24,000 year journey around the sun under 12 signs of 2,000 years apiece. The procession started with the Birth of the Christ, 2,000 years ago. We have just left the Age of Pisces, the age of Christ and Mohammed (the dual fish in the zodiac sign) and entered the Age of Aquarius on January 1 of this year. From Madame Blavatsky to Salvador Dali, there has been the suggestion of the Second Christ as a Buddhist monk. Eko, most sincere of the faithful, is making the transition from traditional Roman Catholic to New Age Buddhist/Taoist (the 108 clicker suggests the Tibetan rosary which has 108 beads – the Dharma insignia is the Ba Gua, sing of the tai chi). Notes on Lost: 10/18/06 episode - Hurley, Locke and Mr. Eko Encounter Spirit Bear They always call them Polar Bears, but like many things in this thoughtful TV show, it works on two levels. In Dharma culture, these two levels are Nirvana (the Unconscious or inner life) and Samsara (the Conscious or outer life). The white bear can best be understood as a Spirit Bear. Hurley fears the bear. Mr. Eko has a full encounter with the Spirit Bear. Spirit Bear is actually a white black bear which is sacred to the Haida Indians of British Columbia. Spirit Bear finds those in the forest who are psychologically Lost, as all the characters on the island are. When Spirit Bear finds you it will take you on a devastating adventure of transformation & awakening. You come out a transformed person with heightened sensitivities and spiritual awareness. Walt has had a Spirit Bear encounter. Now Mr. Eko has had an encounter with Spirit Bear in a cave (and encounter with the Earth). He finds a preternatural sense and is able to see John Locke’s true nature (“You will find them John because you are a hunter.”) Notice the cross has been torn from Eko’s neck. Eko’s faith is pure as it must be with a shaman, but he will find now a fuller context for his newly awakened state. Perhaps Locke is unable to undergo a Spirit Bear transformation as his faith is thin and based on intellectual properties. He needs “signs” and proofs. Mr. Eko’s faith is innate. Locke will anchor in Eko’s faith. Notice that Locke turns Mr. Eko's church into a sweat lodge, a house of transcendence of North American First People. Notice that Mr. Eko also loses his Jesus Stick to Desmond during the explosion. Desmond, Mr. Eko and John Locke are sure to evolve as the Three (see "Three Celestial Ones" on this blog). See Touching Spirit Bear by Ben Mikaelsen. D.T. Suzuki's last words were: "Don't worry. Thank you! Thank you!" An introduction to his way of thinking can be found at the World Haiku Review. His small book, Introduction to Zen, is recommended. Photo of Dr. Suzuki's grave from World Haiku Review by Museki Abe of Tokyo. The End of the World: dream of "Dali"
This more or less completes the ideas and themes which comprise this journal's original intentions. The other night I had a dream that I was driving into a city with "Dali" a Hindu Indian woman with whom I had been travelling every day to a city for lunch, over a bridge; she doing the driving. When I told her of my fondness and affection for her, she said, "I'm dying now." This is a dream of the Anima, the female part of a masculine personality - the muse, which guides to prose, poetry and pictures. Death in a dream like this, where the character is arcane as in Tarot cards, generally means a change and a rebirth - a prelude. It was a suitable dream and a suitable time for this to end, as I'd received a yellow robe from my mother-in-law and been writing in it the last two years, then at this Christmas I received from my wife a beautiful long, green fleece robe, made by her. I have had four robes in the last 21 years of marriage - red for the first ten years, then dark blue for another seven years, yellow during the Awakening of this, now green. All marking significant passages and transitions. Like Jim Dine's Husband with His Left Arm on Fire (above) - robes take on a significant cast to the quiet life - synchronicity, say shrinks; the quiet river which tumbles beneath the city - meaningful coincidence. Likewise, there have been dreams to mark these transitions. On the day before I married I dreamed that the Indian warrior Cochise came to my car and we two drove over a bridge, with him doing the driving. This dream with "Dali" was such a dream. One of the first entries in this journal (October, 2005) is miss3's dream of a woman dying, and rising from the death was the Sun God. 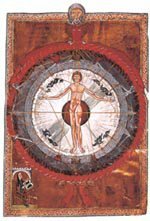 The Sun God archetype appears throughout this artist's work, perhaps the greatest dreamer of all time, HIldegard von Bingen. If you Google "Parthalon Flyingsnake DeCoursy," a name my kids helped make up, about 10 pages come up which interpret Surrealist paintings as dreams, much as they were conceived in the collective state of Unconscious in which these artists worked together and alone. 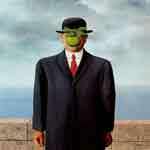 (Or go to this Surrealist website and click on the pictures.) For example: two eggs - Man Ray, Magritte and Dali all had this dream and so did I and many others - a symbol of the New Creation in the Hindu, but not yet Awakened - pictured as a statue of Khrishna holding two eggs (wu chi - unhatched or unmanifest karma - later they will become two birds in a tree, or yin and yang, the life force manifest in tai chi). This picture of man and bird above on the left relates to the famous picture with the Green Apple face - the Son of Man on the right. Here at left he has a white tie, implying an inner condition, while the spirit bird flies to the left of frame, also the direction of the inner condition. In Son of Man the tie is red, implying an outward manifestation of the same condition (consider this to be an expression of wu chi and tai chi, and the moment of turning from the inner unmanifest condition to the outer condition of coming into the world at the date of these two paintings, 1964). 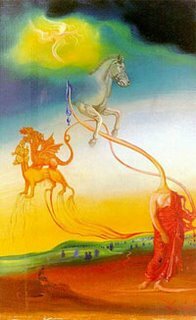 This is discussed earlier at the beginning of these journals in the entry titled: Orange Monk: Salvador Dali's Dream of The Second Coming of Christ apparently as a Buddhist monk.